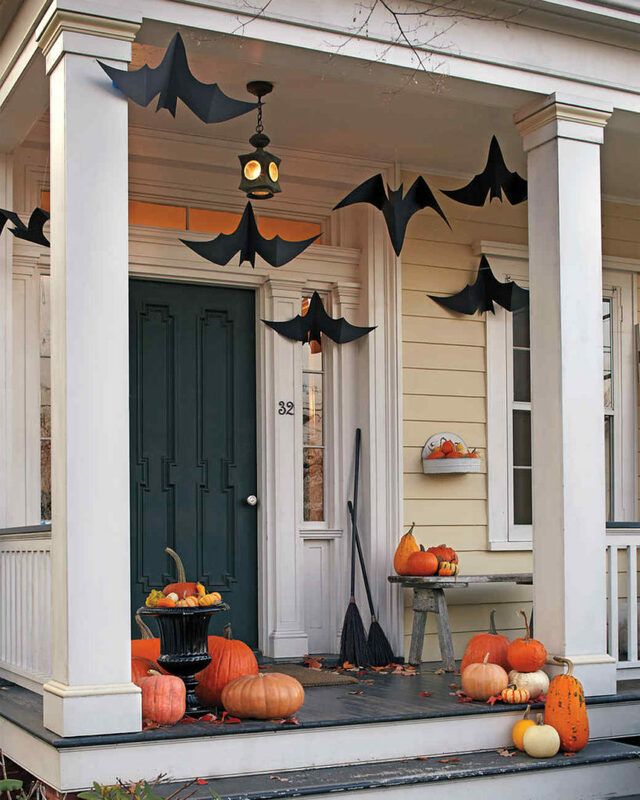 With Halloween just around the corner, now’s the time to give your home a devilish air with spooky decoration. 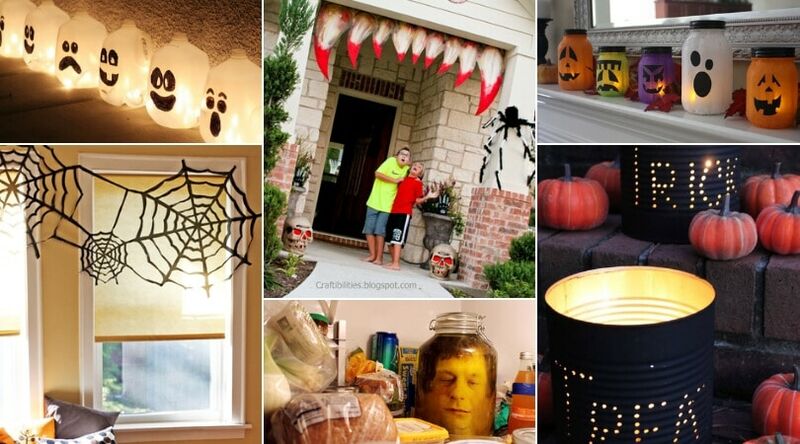 But, don’t go about splurging money on expensive store-bought Halloween decorations, instead, save money this festive season with these DIY Halloween decor ideas. Surprise everyone with your dark and evil side this Halloween with these DIY Halloween crafts. 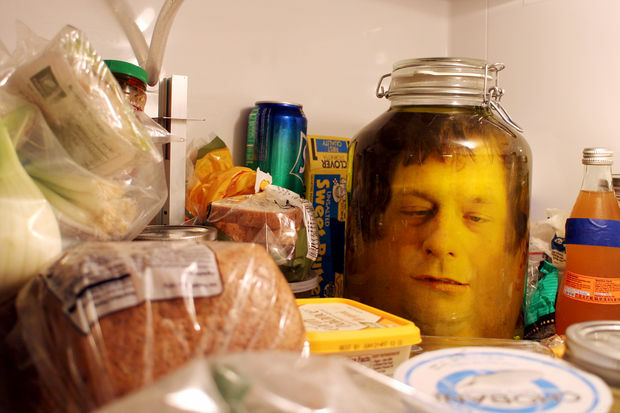 This head in a jar Halloween craft looks so real that it can scare the hell out of anyone. You might be thinking it’s hard to make but in reality, it’s very easy to make. You just need to put a large jar, some food coloring, paper lamination, a printer and a photo editing software to a creative use and you can make your own version of this scary DIY Halloween decoration. The secret to achieving this effect is to blend the two photographs together, then laminate it and put in the jar! If you are a fan of the Haunted Mansion at Disneyland, then you would definitely want to add them to your DIY Halloween decor to-do list. 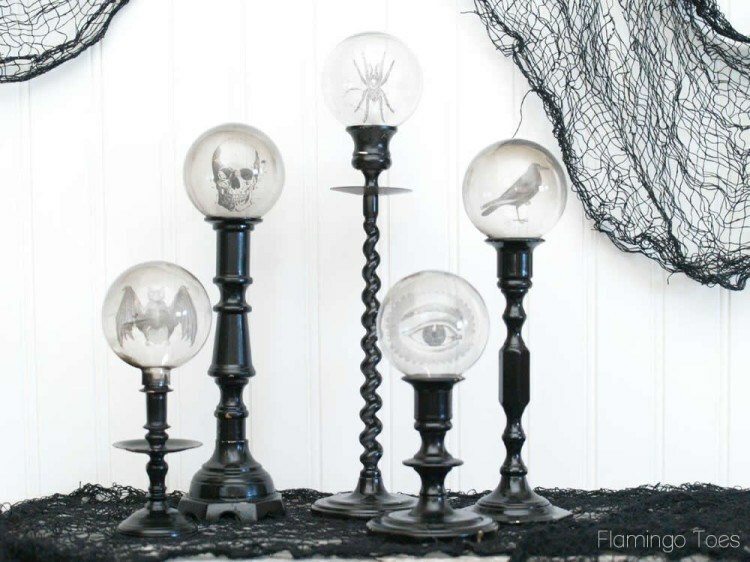 These crystal balls definitely add creepiness and are definitely an eye-catcher. Plus, they are super easy to make too! Flamingo Toes has a quick tutorial on how to easily make them. 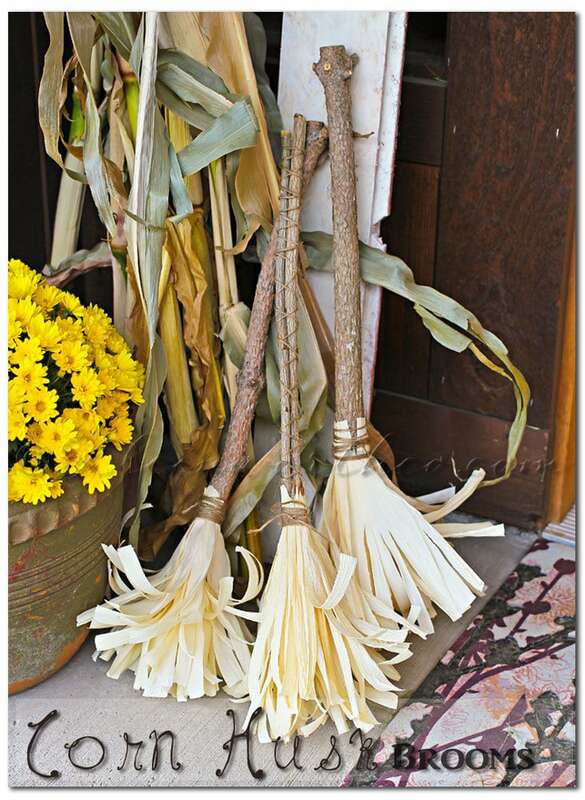 Turn a dried corn husk and twigs into a witch broom. This DIY Halloween craft is really easy to make and is a perfect project to do with your kids. This is a perfect candidate for best out of waste decor idea and is made from the stuff you already have around the house. 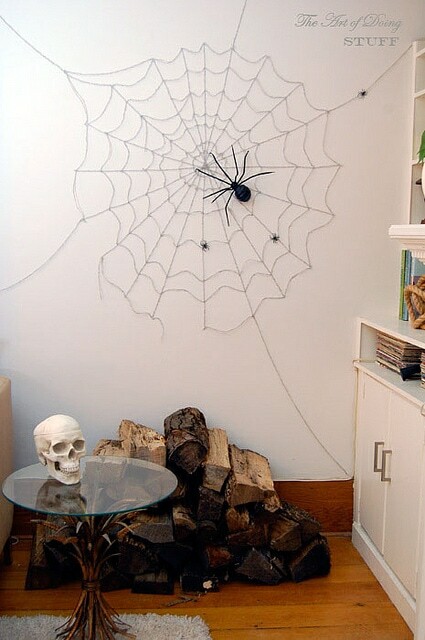 This is a super cheap and brilliant idea to make spiderwebs all you need is trash bags, scissors, and tape. Jessica from How About Orange has a step-by-step tutorial on this. 5. 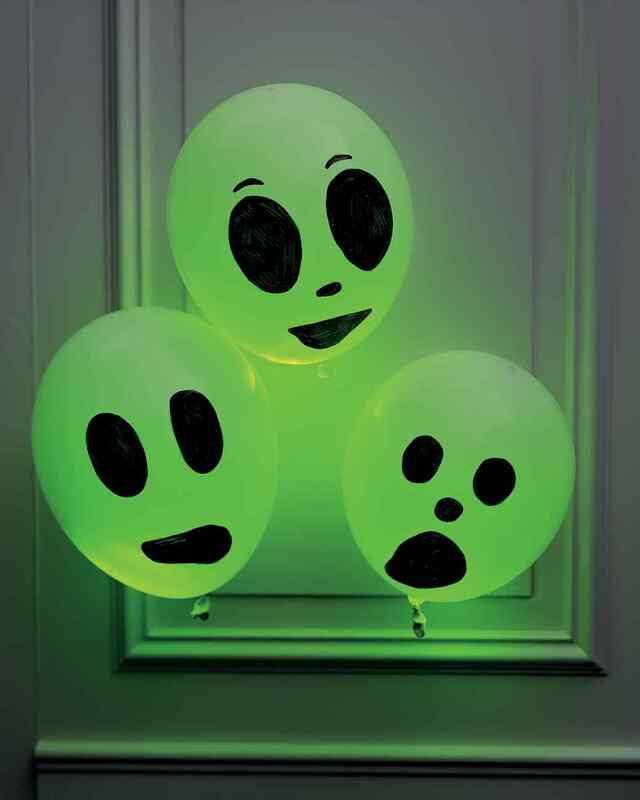 Spooktacular Halloween Wall Lights! 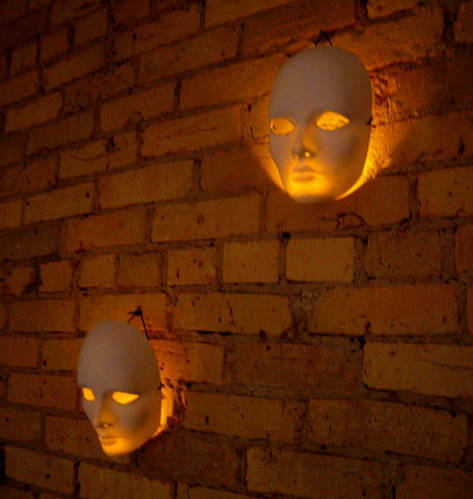 Hiding LED tealights which flicker like real flames behind a spooky craft mask will give you creepy glowing eyes. Decorating your walls with these self-made lights lining the surface will add an exceedingly cool effect to your Halloween decorations. These Spooktacular Halloween Wall Lights that need no craft skills to prepare at all, can add an exceptional charm to the festive mood. This easy DIY project repurposes a simple lantern into something that will get you into the spooky mood without breaking the bank. 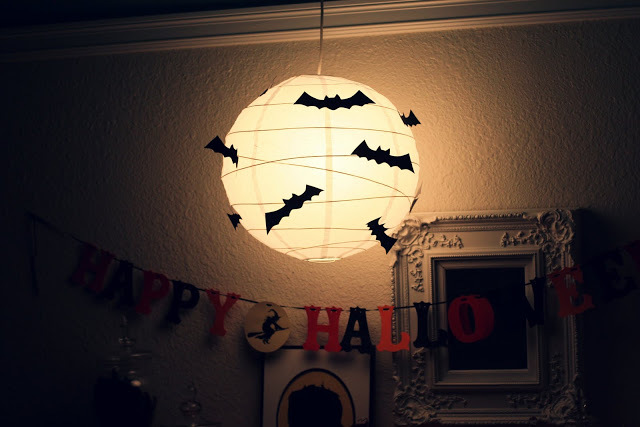 Create your own bat lanterns and get them hung in the middle of your living room or simply above the treat table. 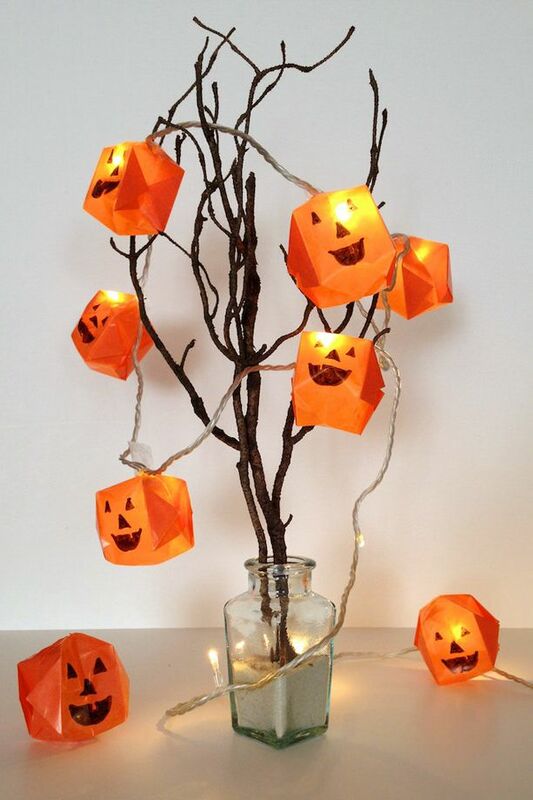 You will be amazed at how easy it is to create these truly exciting Halloween lanterns. Spruce up your space by creating these spectacular ghostly guys just by using old milk jugs, a permanent marker, a craft knife and a string of lights. 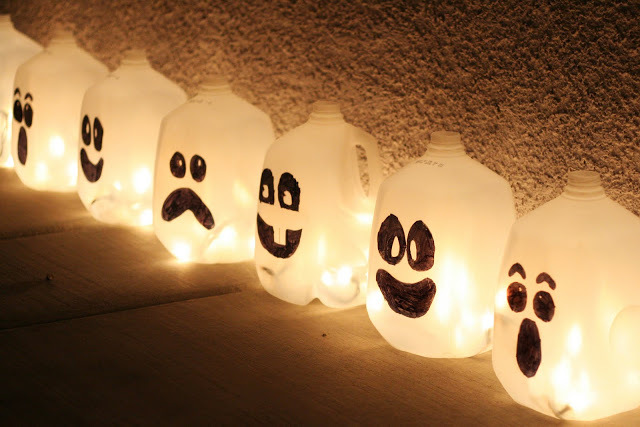 Put a group of these glowing jugs in front porch or along the walkway to say hello to those lovely little holiday visitors. 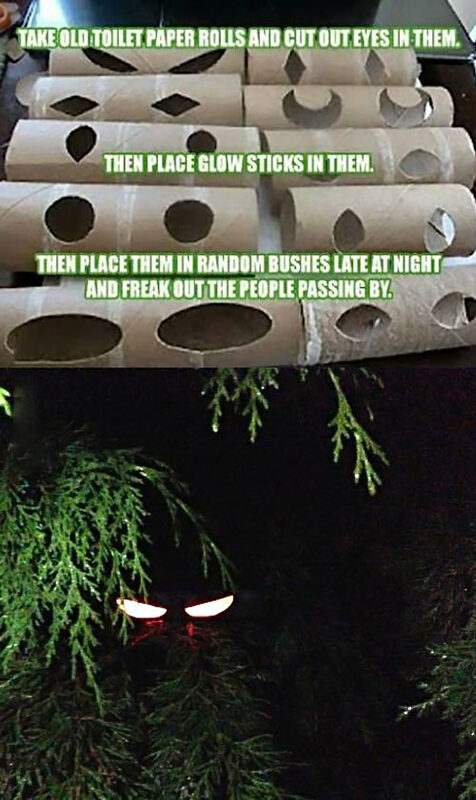 Create a devil with bright glowing eyes peeking out of bushes using some old, empty toilet paper rolls and some glow sticks. Isn’t that amazing? Freak out everyone passing through your home with these bone-chilling creatures. Take a look at this pictorial representation of how you can make these devils work and have a fun-filled Halloween. Liven up the spooky scene at your house with this cheesecloth ghost this Halloween. Easily make these ghosts with inexpensive materials from the craft store. You just need some cheesecloth – which can often be found in your grocery store if the craft store doesn’t carry it – cornstarch, felt, and water. A few simple steps, and make your house haunted in no time! 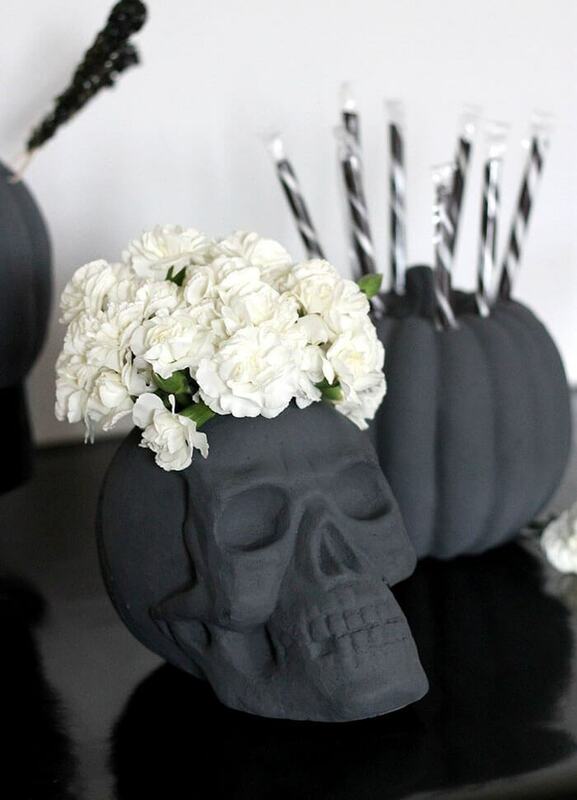 Amp up the spookiness factor in your tablescape by replacing normal vase with these DIY skull vase. The best part is they are super easy to make and perfect for a sophisticated Halloween look. 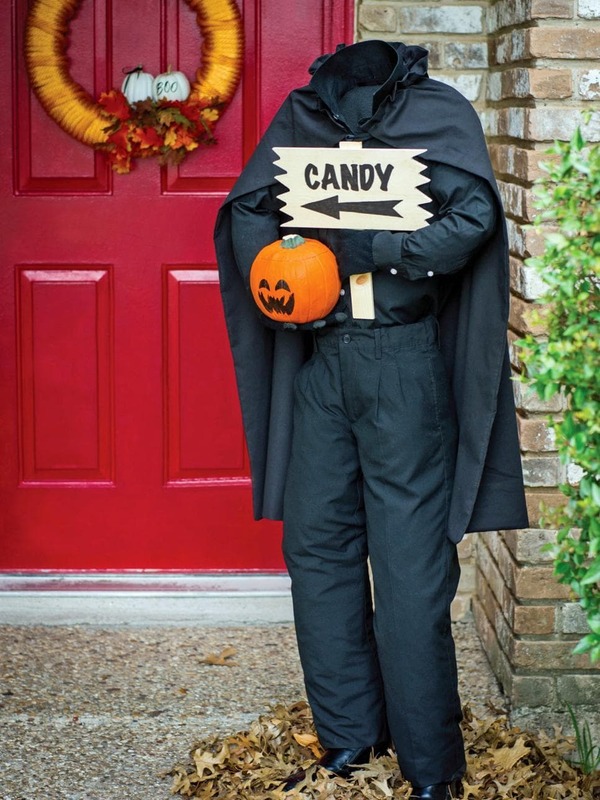 Welcome Halloween visitors with this headless horseman standing just outside the front door or on your front porch! Creating this Halloween craft does require some time and work but it is well worth the time as it takes your Halloween decoration to a whole new level. 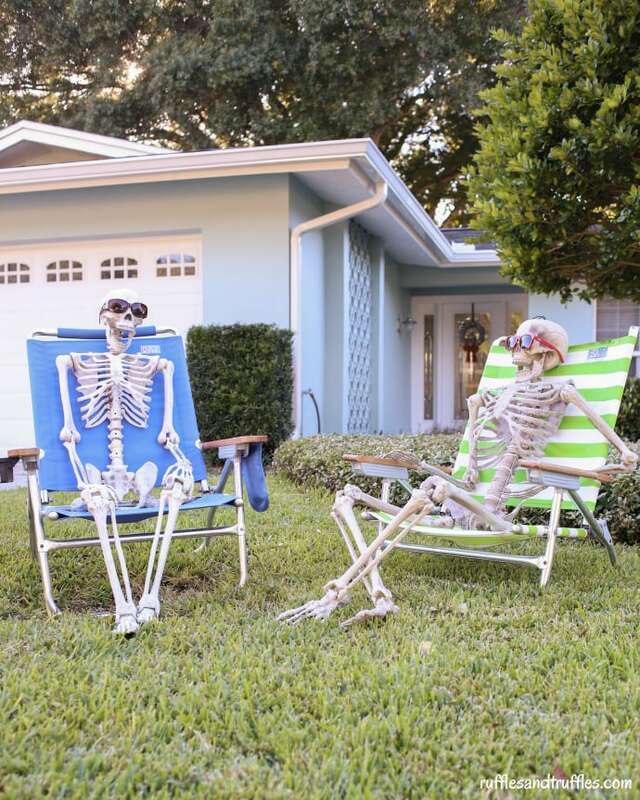 These DIY Skeletons spending a chilled out afternoon in your lawn is a perfect lawn decoration for Halloween and can give goosebumps to both young and old. Increase the element of terror by posing them creatively and you have the perfect creepy companions for your Halloween party. 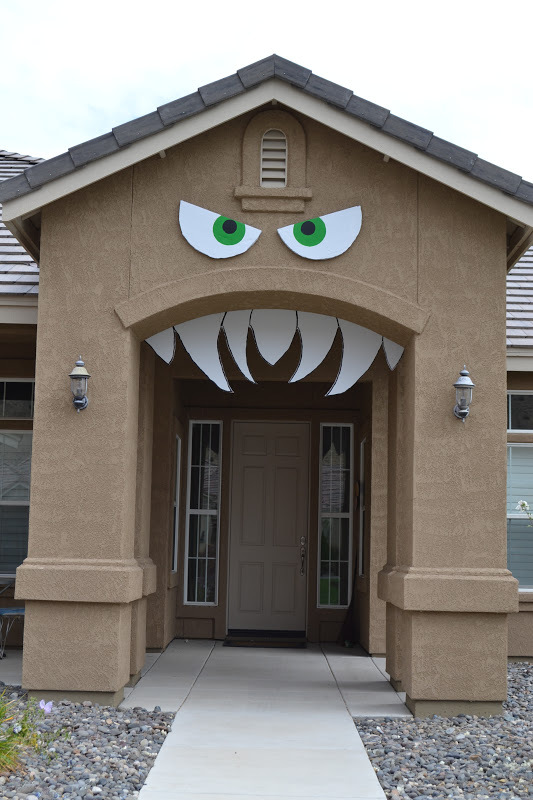 Turn your house into a monster with huge canines and freaky bright green eyes! It’s a perfect last minute decor idea, all you need is a basic cutting of a foam board, acrylic paint, and long screws. You need basic artistic skills which everyone possesses to shape and color the teeth and eyes of the monster. Once ready, hang the teeth and the eyes to your house using long screws. Watching passerby slow down in front of the house to check out the monster will be delightful, isn’t it? 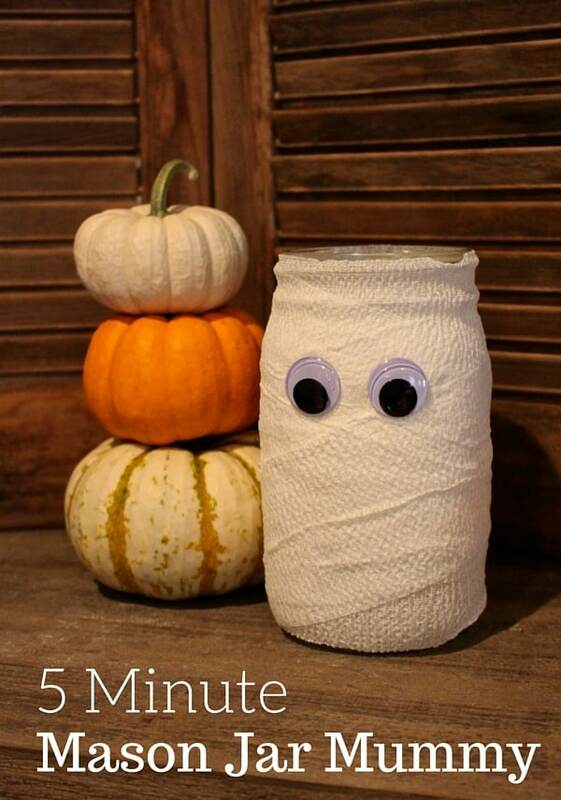 Grab some mason jars and turn them into a mason jar mummy with two large eyes and wrapped in lots and lots of bandage. All you need to recreate the mummy is a large mason jar, eyes, gauze, glue and five minutes to get things done. 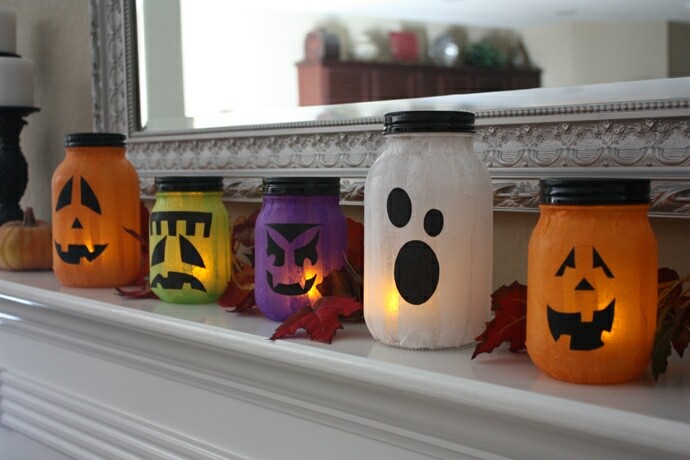 So, Mason jar is not only for luminaires, you can make a lot of DIY Halloween decor items using mason jars. Create a spooky centerpiece with this cool and trendy DIY Halloween decor idea that’s truly cost-effective. From pumpkins to mummies to ghostly designs, these Mason Jar Jack-o-Lanterns are simply effortless to recreate using Mason jars and LED tealights. These DIY Paper Bag Luminaires can contribute exquisitely to enhance the beauty of your Halloween Decor. 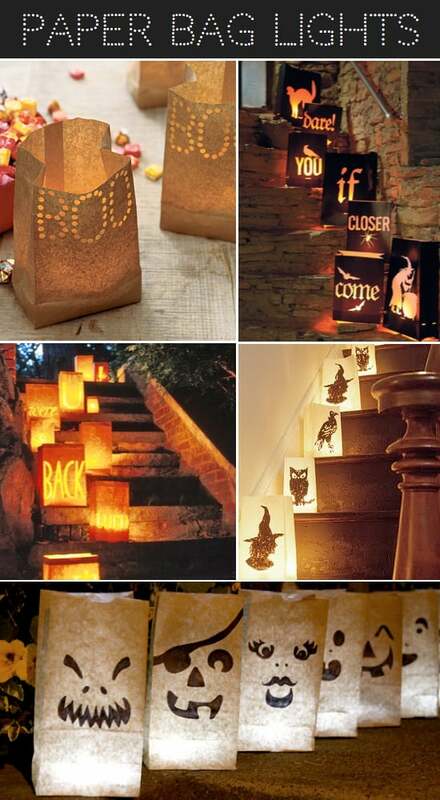 Make these pretty luminaries in a few minutes and place them on a walkway to your space for guiding children to your party this Halloween. Made using bright glow sticks inserted in lovely white balloons, these spooky creatures are utterly easy and quick to make. They do look adorable and friendly in light but with darkness, they start to flaunt their haunting side. Not only easy to make, these spooky creatures are budget-friendly as well! 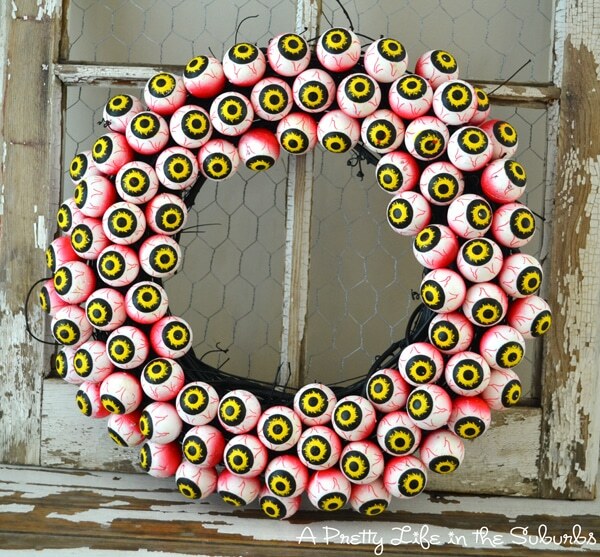 Collect lots of monstrous eyeballs and a wreath to create this amazing DIY decoration all by yourself. Placing it on your front door to welcome trick-or-treaters and visitors can be immensely frightening. So, make this creepy and fun wreath to add some fright to your welcome door. These paper bats swarming or randomly flying over your wall is a great way to bring a freaky festive ambiance to your home almost instantly. All you need to do is trace, cut, bend and stick. It takes no more than about an hour to craft out these amazing paper bats. Marvelous Mommy has detailed step-by-step instructions to forge the idea. These DIY Spider Sacks look remarkably stylish and are so easy to make that even Kids can join you in the action to make this. All you need to craft this DIY decor is some yarn, glue, and balloons. Modernparentsmessykids has step-by-step instructions to make your own version of Spider Sacks. 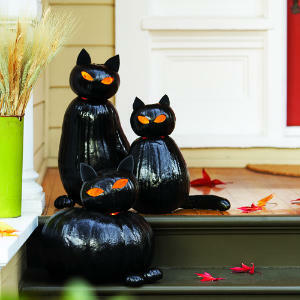 Crafted out of huge stacked pumpkins these spooky Halloween Cat O’Lanters are an unusual and gorgeous version of classic Jack O’Lanterns. Placed anywhere, these freaky felines with bright golden eyes are surely going to freak everyone out. Repurpose a string of white Christmas lights to craft this spooky origami lights. These little jack-o’-lanterns made with orange paper are so easy to make and affordable as well. This DIY Halloween decor idea will transform your house into a huge monster and brings it to life. 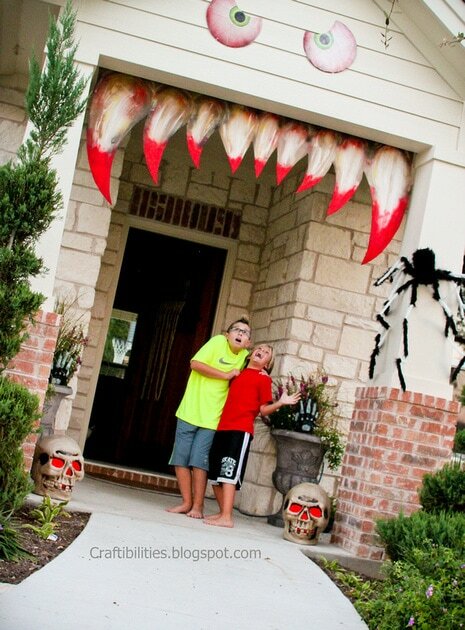 Your house will definitely look devilish with the addition of spooky bloodshot eyes and huge pointy teeth. Invite this monster to your front door using acrylic paint and some wood sheets by following the easy and step-by-step tutorial. Turn your front porch into a bat cave with these paper bats. These realistic paper bats will definitely add a scary element to your front porch. What more? These bats are super easy to make and are an affordable decor idea. Use plastic skulls and terracotta saucers to create a spooky Halloween themed candle holder. Making this candle holder require no time and is quite affordable too. 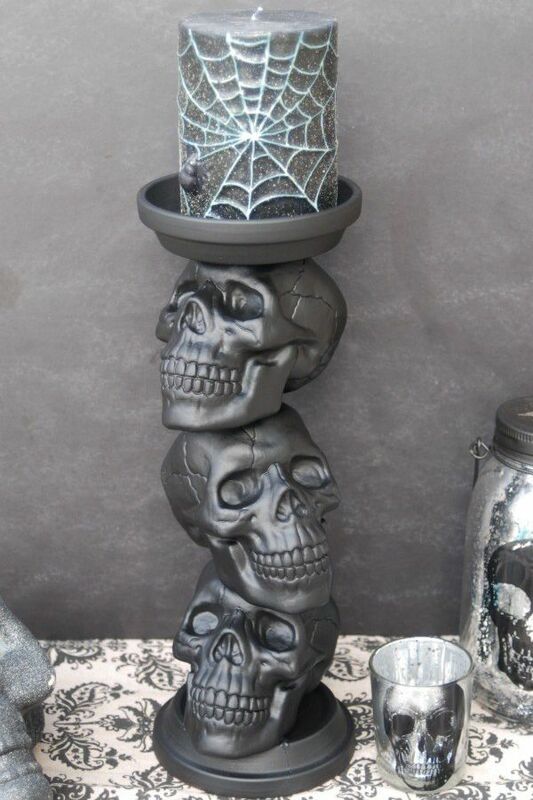 All you need is some plastic skulls, spray paint, terracotta saucers and a hot glue gun and you can have this spooky candle holder ready. 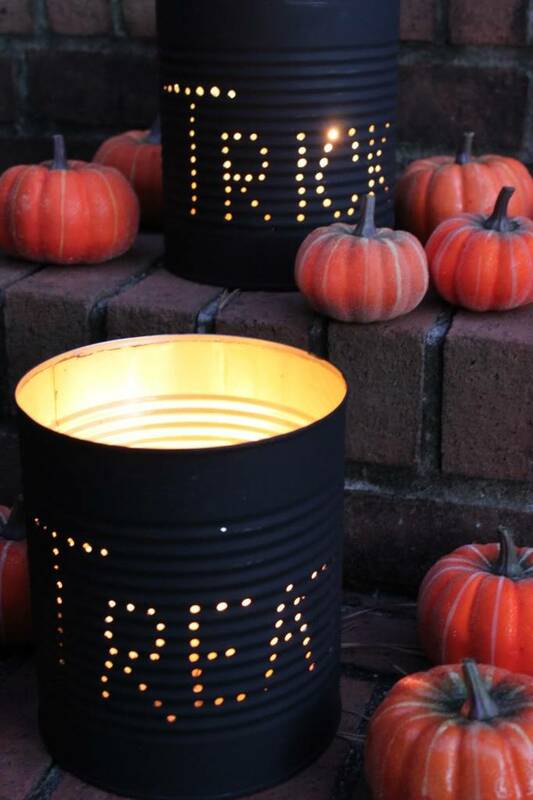 Halloween Tin can lights look awesome with gorgeous scattered light patterns and you can easily make one by using old tin cans lying around your house. So, ditch the expensive store-bought luminaries and make budget-friendly luminaries all by yourself by punching some holes in old tin cans around the house. 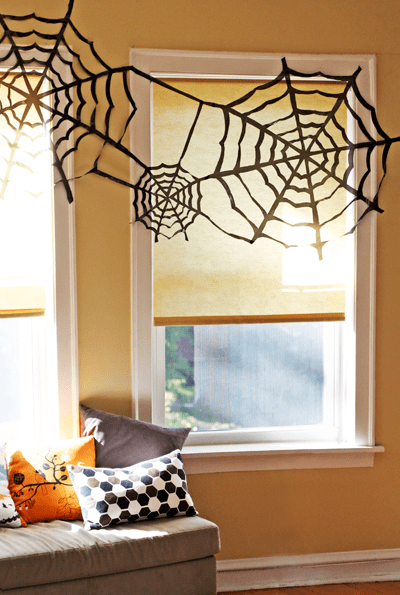 Cover the walls with giant and creepy DIY spider webs to celebrate the charm of Halloween with this DIY Halloween decor idea. 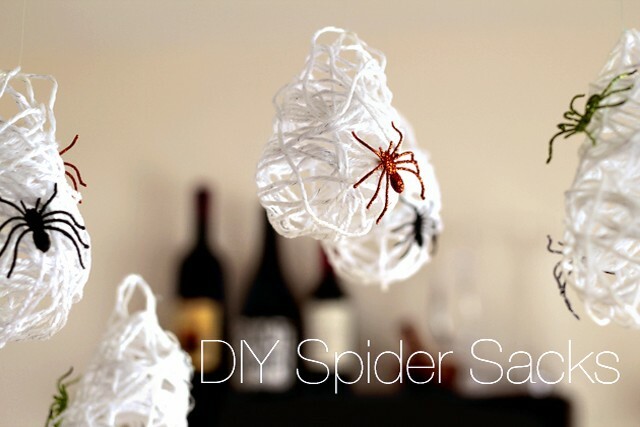 All you need is yarn, a two-sided tape, and some toy spiders to make your own spooky spider webs in minutes. Cheesecake ghosts, a total rage during Halloween and a classic home decor element that’s fun and easy to create all by yourself. 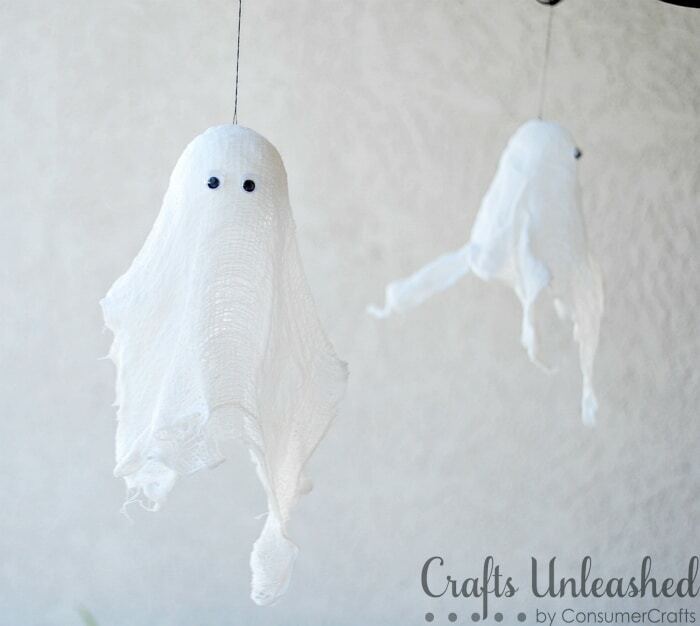 Crafts unleashed has an awesome tutorial to make some cheesecloth ghosts that are perfect to be suspended from your ceiling, chandeliers or the trees in your backyard. Yet another cheesecloth ghost but with a difference in the look. 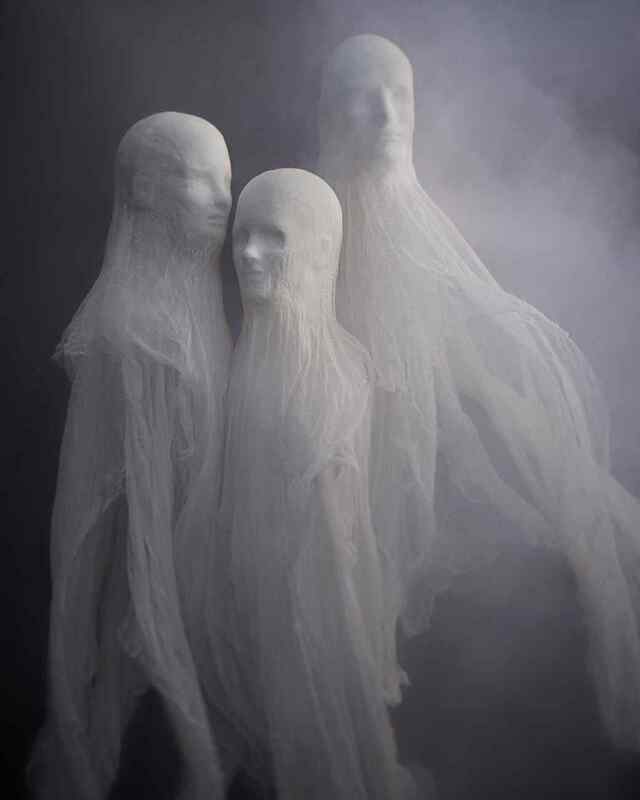 These cheesecloth spirits made using styrofoam mannequin heads are sure to up the scare factor around your house. They look amazingly real, yet so easy to make and budget friendly. Get the unbeatable combination of black and white to your Halloween decor with this top-notch topiary for your front porch. 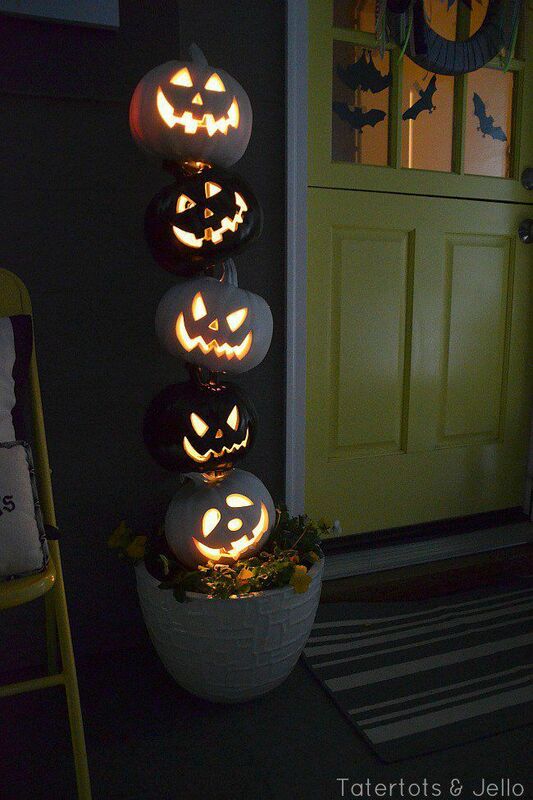 It’s extremely easy to make and can be crafted with cheap dollar store plastic pumpkins. Inspired by Harry Potter, take your Halloween decor to a next level by creating your own Dementor and thrill everyone to the core! This surprisingly easy DIY project will take a bit of time but it will make the decoration at your house talk of the town. What else does one need to get that perfect spine-chilling touch to this year’s Halloween Celebrations? Share on Pinterest and spread the knowledge! Use one or more of these easy and quick DIY Halloween decor ideas to make your house spooky festive this year and grab some huge appreciations from all who turn up to your party. Happy Halloween!